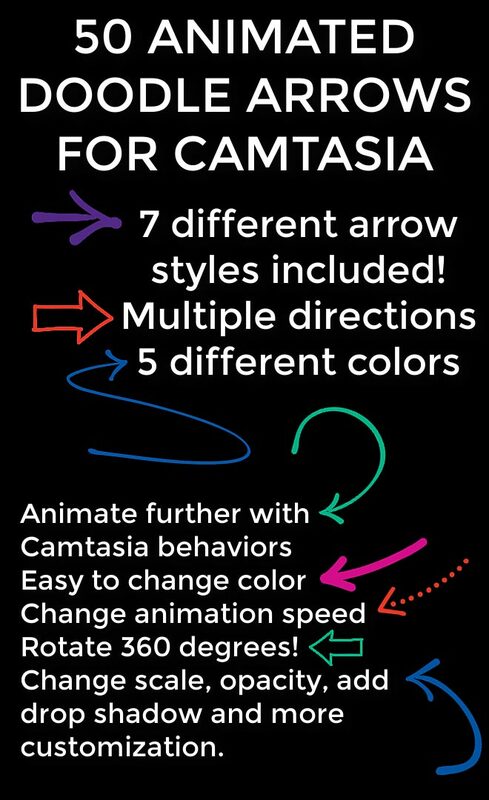 New Camtasia Animation Templates! In this collection of templates you’ll find 50 animated-drawn doodle arrows. Check out the video below for an overview. There are seven different arrow styles, in 5 different pre-made colors. You can further use colorize in Camtasia to set any color you need for your project. Unsymmetrical arrows also come in two angles. You can animate these further with Camtasia behaviors, change their speed and rotate them 360 degrees. Change scale, Opacity, Add drop shadow and more customization. Installs into the Camtasia library and come with organized titles so you easily find what you need. After installation just drag-and-drop from timeline into Camtasia.